GloFX Color Therapy Glasses with UV400 Protection, Provides UVA and UVB Protection. Choose Your Own 5-Pack Allows You To Select Your Favorites. Color Therapy, or the use of colored light in healing the body is a concept that is over 1,000 years old. The idea is that our bodies ‘feed’ on certain colors of light within the visible spectrum of natural light, and that each of these Colors represents a certain function within the body. Select your favorite 5 colors and build your own bundle! There are a multitude of beneficial effects associated with Color Therapy. 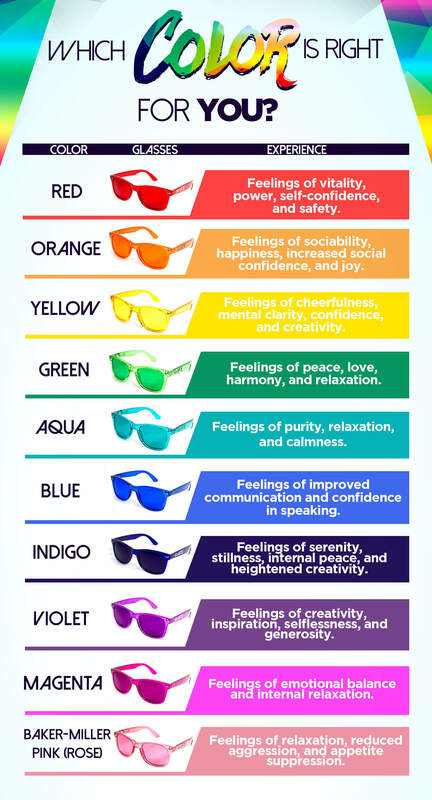 By wearing a pair of these high-quality Color Therapy Glasses for 10-30 minutes each day, it is possible to experience an enhancement in mood, as well as other beneficial effects. Color therapy is known to help with anxiety, depression, writer’s block, stress relief, and a plethora of other conditions. Magnetic 8 Piece Wrap Set - Amazing deal!